Picardy in Northern France is particularly well-liked by those who love fishing and water sports. Horse riding, golfing and archery are also popular in the region with a major archery festival-taking place every spring. Picardy has a varied landscape with great forests and natural parks. From the 16th century to the end of the ancien regime in 1789, the province of Picardy stretched from the English Channel to Saint Quentin and included the Somme River basin. Under the Salian Franks of the 5th century, Picardy included six countships. Of these Amienois and Vermandois were gradually brought under the regime of King Philip II Augustus in 1185. Ponthieu was a fiefdom of the English until its complete possession in 1369. Under the Treaty of Arras in 1435, the Dukes of Burgundy acquired several regions. In 1477, France’s Louis XI conquered Picardy and from then on it was a frontier area, very often invaded by Habsburg Netherlands, until it was acquired by the French in 1659. Picardy saw some of the fiercest battles of World War I, which is evident from the popular English song ‘Roses of Picardy’ (1916). It was also the scene of some of the bloodiest battles of World War II. The town of Amiens to the North of Paris is known for its 13th century cathedral, which is the tallest and most spacious in France. With extraordinary sculptures particularly in the front and the south transept, the cathedral also has an inlaid floor with several varied designs. The cathedral is listed as a National Monument of France. The Saint Leu region is just beneath the cathedral and has canals doted with little houses. The Hortillonnages is a fascinating place with a 300-hectare park in a marshy region, criss-crossed by several canals. The Northern town of Laon has the cathedral Notre Dame of Laon dating back to 12th-13th centuries and whose towers can be observed from anywhere in the surroundings. A mini tram-metro system helps explore the town, which has several medieval buildings. The larger town of Beauvais has suffered destruction during the Second World War. The astronomical clock here, pertaining to the 19th century, is presumed to be the largest of its kind in the world. The town also has a museum dedicated to the history of rug and carpet making, Galerie Nationale de la Tapisserie de Beauvais. The town of Chantilly is the horse racing capital of France. It has come a long way since 1830 when racing was introduced from England. Today, you can see about 3000 thoroughbreds being trained in the countrysides. 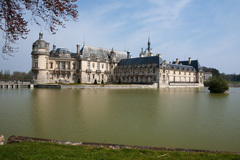 Apart from horse racing, Chantilly also has several parks, forests and chateaus. The Parc Asterix is a well-visited park dedicated to the character Asterix. The town of Abbeville offers a great opportunity for exploring the Picardy coastline. With fishing ports like the Le Crotoy, the region also offers sailing, kayaking and kite surfing. The Musee Boucher-de-Perthes has a rare collection of prehistoric artifacts. The medieval village of Gerberoy is listed as one of the most beautiful villages of France. Among its attractions are the covered market, the cobbled streets and the half-timbered houses characteristic of the 17th century. Gerberoy may be described as a living example of medieval France. Also called ‘Ville d’Art’, the town of Saint Quentin has a rich 1920s and 30s heritage. Saint Quentin is the only town in France, which has a big nature reserve, home to numerous plant and animal species. The town hall is a prominent Gothic structure with about 173 sculptures and 37 bells in its bell tower. There is also a butterfly museum with over 60,000 species from all over the world.